The two brightest planets, as viewed from Earth in the evening sky, will appear to come extremely close at the end of the month. In a somewhat rare, close conjunction, Venus and Jupiter will seem to come within 0.3 degree of each other; not until August 27 of next year will they to seem to come this close again. Even now, as June is ending, Venus and Jupiter can be seen getting closer to each other, each evening after sunset in the western sky. While most observers will see the apparent close approach of the two planets on the evening of June 30, the actual conjunction (astronomically, the moment when both objects have the same Right Ascension: 9 hours, 37 minutes), occurs the next morning. 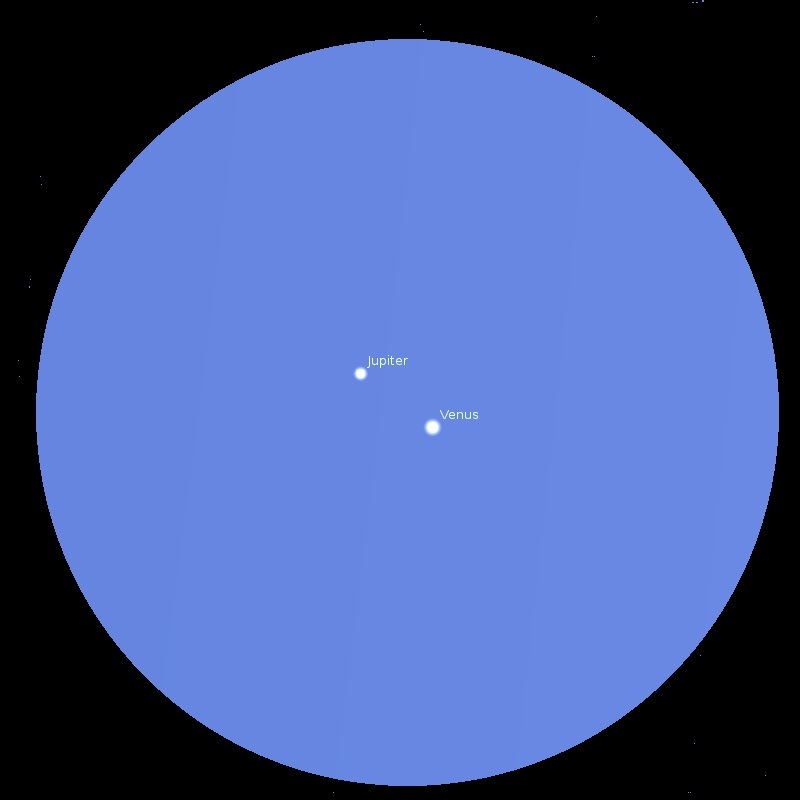 The conjunction of Venus and Jupiter occurs on Wednesday Morning, 2015 July 1 at 10:00 a.m. Eastern Daylight Saving Time (EDT) / 14:00 Coordinated Universal Time (UTC), when Venus will be 0.4 degree south of Jupiter. Of course, the evening of July 1 will also be a good time to see the aftermath of this conjunction, when the two planets still appear very close. So, June 30 – July 1, Venus and Jupiter will appear so close, the apparent distance between them will be less than the diameter of viewing the Moon during the Full Moon phase. You should be able to stretch-out your arm and cover-up both planets at the same time with your “pinky” finger (now, that is rare)! In fact, you may have trouble distinguishing the two planets, separately, unless you use a telescope or binoculars. Now, this event will occur each evening, from now through several days after the July 1 conjunction, as the two planets approach each other then separate after the conjunction, just after sunset in the western sky each night. Venus, being much closer to the Sun, always appears either shortly after sunset or shortly before sunrise. Venus, being the brightest planet in the sky, will be very easy to find after sunset. In fact, it is so bright, that it is common to be able to find Venus a few minutes before sunset, which some people consider even more beautiful with a cobalt hue background of the early evening twilight. Being somewhat dimmer, Jupiter will be seen shortly after sunset, and it will be easy to find as it will appear as the brightest object just above Venus. Another relatively bright object will also be visible in this area of the sky, the Star Regulus. Officially known as Alpha Leonis (a Leonis), Regulus is the brightest star in the Constellation Leo the Lion. Regulus will appear above, and a little to the left of Venus and Jupiter, as you look in the western sky. Outside the Sun and the Moon, Venus and Jupiter are the brightest objects that can be seen in Earth's sky. Sometimes erroneously referred to as the “evening star,” Venus outshines any other planet as viewed from Earth for three reasons: Venus is the closest planet to Earth, it is closer to the Sun than Earth (second planet from the Sun, while Earth is the third), and Venus is constantly obscured by clouds which reflect the Sun's light more intensely than Jupiter's clouds (as Venus is much closer to the Sun than Jupiter). Venus is so bright, that often people will confuse it for a "UFO" (unidentified flying object). At the July 1 conjunction, Venus, the brightest planet in the sky, will measure: - 4.6 in Visual Magnitude. The Visual Magnitude of the second brightest planet in the sky, Jupiter, will be: - 1.8. The Visual Magnitudes of the planets vary, depending on how close they are to the Earth and to the Sun. In the case of Venus, the brightness also depends on the phase of the planet (for this conjunction, Venus will be in a “fat” crescent phase). Both Venus and Mercury, the two planets closer to the Sun than Earth, have phases somewhat similar to the phases of the Moon. Most stars, except for variable stars, have a fairly constant Visual Magnitude. Hence, Regulus will be shining at a Visual Magnitude of 1.36, as always. Only about ten hours after the actual conjunction of Venus and Jupiter, the Moon's Full Moon phase occurs: Wednesday Evening, 2015 July 1 at 10:20 p.m. EDT / July 2 at 2:20 UTC. And, because this Full Moon comes on the first day of a 31-day month, the second Full Moon of July is known to some people as a so-called “Blue Moon,” which will occur Friday Morning, 2015 July 31 at 6:43 a.m. EDT / 10:43 UTC.